» City’s camping ban: The penalty? City’s camping ban: The penalty? Bryant Park on a rainy day in April: Not an inviting place to camp. So has anyone been charged with illegal camping since the Albany City Council passed its camping ban on public property on March 28? And what would be the penalty in a case like that? 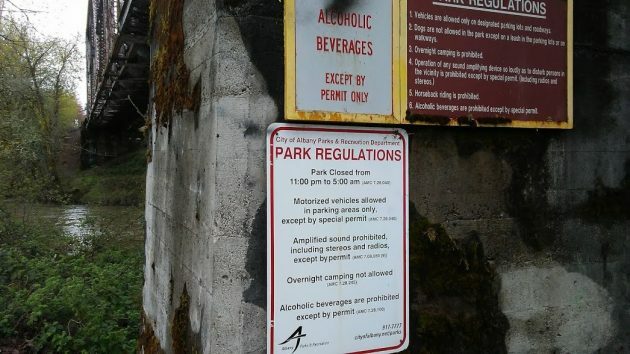 The camping ban applies to any public property, including sidewalks and the space under bridges including the Pacific Boulevard viaduct, which has been a spot where homeless people often spent the night. The ban also covers parks, but overnight camping in city parks has been unlawful before, for decades in fact. I wondered if anyone had run afoul of the new law. The police department told me Thursday there had been only two citations since the new ordinance took effect. 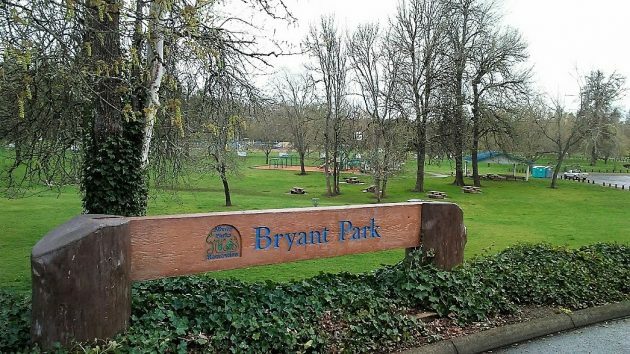 A man and a woman were cited on April 7 for camping in Bryant Park. Two weeks before this, they had been found camped in the park and warned, according to the police. Their citation gave them a time to appear in Municipal Court: 10:15 a.m. on April 25. Marilyn Smith in the city manager’s office told me these two were cited under long-standing city regulations against overnight camping in parks rather than the new ordinance. Either way, what’s the potential penalty? These two citations list a possible fine of $2,500, which along with a year in jail is the maximum fine for a misdemeanor. That’s a highly unlikely penalty in a case like this. The Albany Municipal Code gives the city prosecutor the option, depending on circumstances, of treating any misdemeanor as a violation, an offense for which the maximum penalty is a civil fine of $1,000. Jessica Henson, the assistant city attorney who prosecutes cases in city court, has not seen these citations yet. Typically she doesn’t get involved unless defendants are represented by lawyers. Cases like this often get resolved at the first appearance, the arraignment, if people plead guilty or explain their circumstances to the judge. Henson told me she considers the circumstances. So, for example, if someone is caught camping in a park because of hard luck but is working to procure housing, she’s likely to drop the complaint. “I care about them,” she said of people appearing in municipal court. Why in the heck did the council not talk about penalties…they know darned well that homeless people can’t pay them. Did they not talk about it because they didn’t want to seem callous and heartless? And….they wanted to get their ban on homeless people passed into city law. We need a good housecleaning at city hall….starting with electing a new mayor and proceeding to elect new councilors. Yet another example of cosmetic, feel-good legislation designed to make the unsympathetic Councilors seem slightly less ghoulish. After all, if the Council deems it punishable to be caught camping inside an encirclement defined largely by commercial interests, then the only thing holding the Council back is how large a piece of Albany can effectively be made off limits for the less fortunate. One imagines a Trump-like “beautiful wall” surrounding Albany City Limits, holding the “Walking Homeless” at bay. One looks forward to the stream of bad on-line press for Albany as word of the Council’s crackdown spreads.